Source: Greenwich Graphic: March 14, 1913. Isaac L. Mead died at his home on Lafayette Place on Saturday morning, in his 79th year. Mr. Mead had recently suffered from shock, and early last week submitted to a serious piece of surgery performed by Drs. Griswold, Brooks and Clarke, designed to afford relief, and as he rallied readily it seemed to have proved successful. But relapse followed later, and he passed away finally as above stated. Mr. Mead was one of the first organizers of Lombard Post and had been its commander. He was a Connecticut veteran, serving in the Civil War in Company I, Seventeenth Regiment 3 years. He was attached to the invalid corps as a member of the Sixth Veteran Reserves, and served until 1865, when he mustered out at Cincinnati. He was a member of the Congregational Church and Acacia Masonic Lodge. 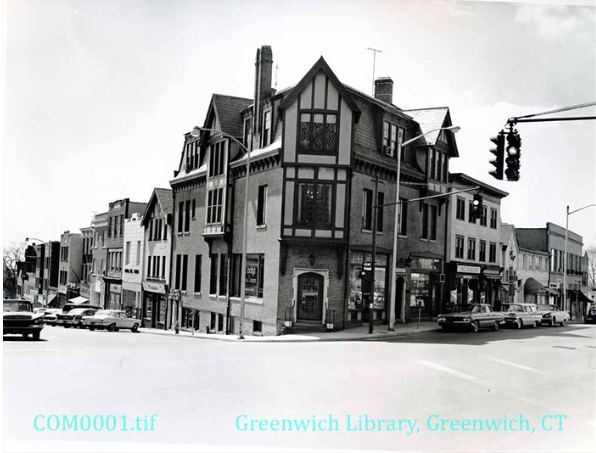 This is an old image of the Isaac Lewis Mead Building at the top of Greenwich Avenue. The building is still there. Mr. Mead was a public spirited man and took great interest in whatever concerned the town and the borough. For a number of years he was a member of the Board of Burgesses and a very active member of that body, suggesting and putting through a number of important measures. As a member of the Board of School Visitors for many years, or until his blindness interfered, he was an indefatigable worker, being intensely interested in the work of putting the schools on as high a plane as possible, and what’s more he spent much time and was at some trouble in doing his duty, for which he took no pay, although entitled to remuneration for every visit he made to the schools. He believed in good schools, good teachers and good school houses. His ideals were high, and so far as he could he tried to bring the schools up to a higher plane, and did much for their betterment. Putnam Cemetery, said to be one of the most picturesque, best laid out and attractive places of its kind along the shore, came about through Mr. Mead’s suggestion, planning and general work. He started the company that brought the plot and was superintendent of the cemetery for a number of years. In everything he did he stood for the best. He was of the old school of New Englanders, sturdy, honest and kind hearted, patriotic, loyal and true, and was of the kind of men that are alluded to as having so much to do with having made America what it is today. He was a prominent member of the Connecticut Undertakers Association, the president and secretary coming down from Hartford to attend the funeral services. Mr. Mead was married in 1855 to Esther A. Mead, daughter of Daniel Seton Mead, and is survived by his wife, sons Willis T. and S. Warren, and daughter Miss Lucy A., and a sister Mrs. George H. Mills. He had been married for 57 years. He was engaged as an undertaker in Greenwich for a quarter century, or more but during his latter years became blind and had become more or less of a recluse because of this defect, occupying his mind largely in an improvised shop where his spare time was spent in making gifts for his friends which included wood making into cabinets and such things. 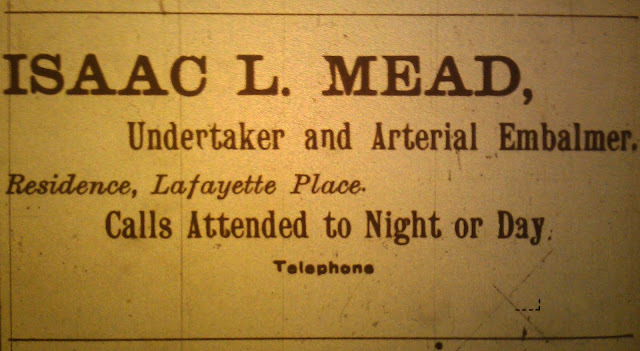 Mr. Mead was greatly esteemed by a large circle of relatives and friends, and his business and social dealings were of the highest type. He was of most generous and sympathetic nature, his benefactions being many although only known to himself and his beneficiaries. For years he was a central figure in the business life, upbuilding and enterprising in his efforts to promote the general interests of Greenwich. He erected the first brick business building in Greenwich village, at Greenwich and Putnam avenues, which never passed from his possession. The funeral services were held at his Lafayette Place home and were attended by a large assemblage of relatives and mourning friends, Rev. Mr. Taylor of the Congregational Church officiating, interment being in Putnam Cemetery.